About 3 years ago, I shared a recipe for the Apple Thingamajig, the name resulting from the inability of Zia and myself to remember the dessert’s correct name. In the Comments, some suggested calling it a “galette”, still others called it a “crostata.”, and I’ve even heard it called an “open-faced” or “rustic” pie. We would never have called it a crostata, however, for reasons I had intended to reveal shortly thereafter. You see, I had planned to share today’s recipe that Christmas (2011). Having missed that opportunity, crostata was to be featured the following December (2012), and, having failed that, last December (2013) would most certainly see a crostata recipe published. And, so, here it is 2014 and the crostata recipe is finally making it to the big time. 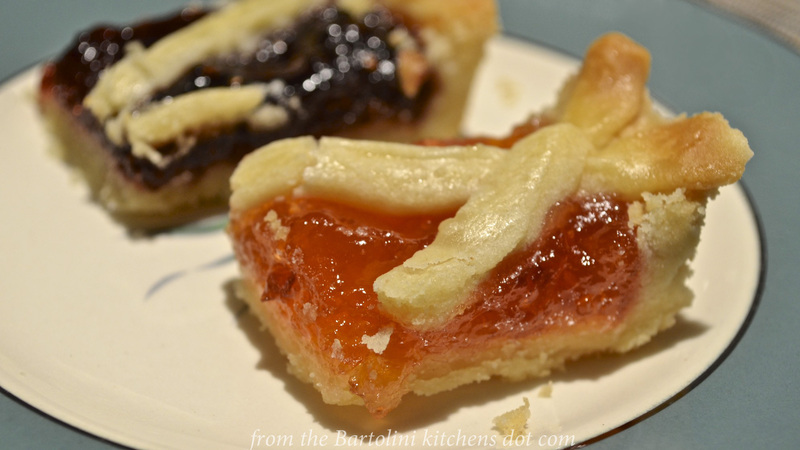 Even so, and to get back to my original point, say “crostata” to my family and we think of a jam-covered tart very much like the ones pictured throughout today’s post. So why share the recipe now? 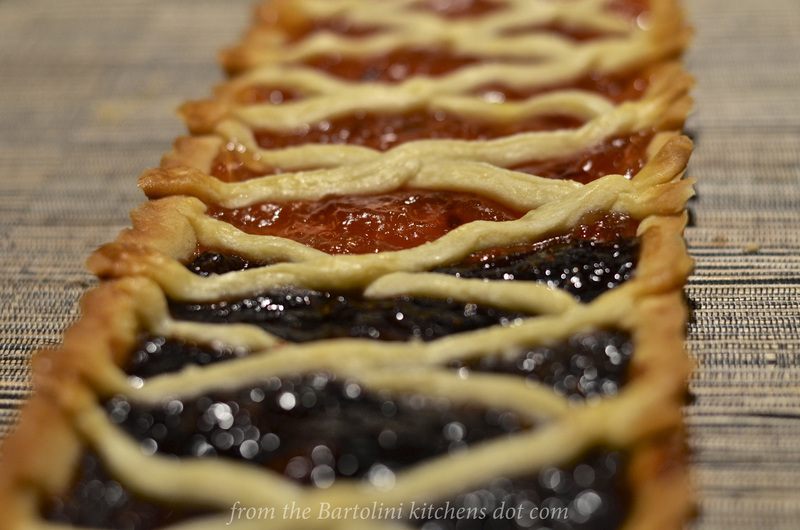 Well, recently a good friend of the Bartolini Kitchens, Stefan of Stefan’s Gourmet Blog, shared his crostata recipe. (If you’ve not visited Stefan’s site, this is your chance. His is a fantastic blog filled with many wonderful recipes and you’ll find his Italian dishes as well-researched as they are delicious.) Seeing his crostata recipe lit a fire under me and I decided this would be the year to finally share the recipe for the benefit of the rest of the Clan. This time, though, I’d publish it ASAP, so, that there would be little chance of it being forgotten again in the rush towards Christmas. We could always count on Mom preparing several treats for the Christmas holiday. 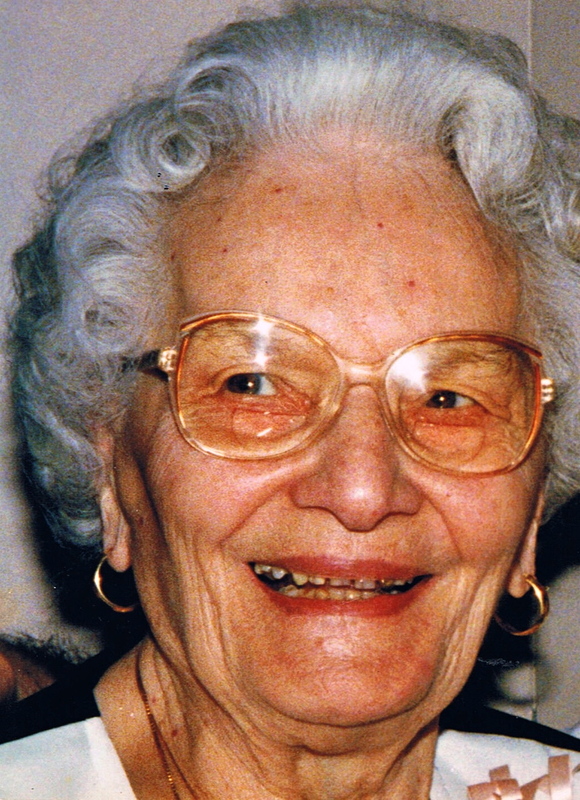 Though she started making chocolate candies in her retirement, she always made sure that there were plenty of biscotti and a crostata for Christmas Day. For me, it wouldn’t have been Christmas without either being present, no matter what else she had prepared — the platter of ravioli notwithstanding. Not having any tart pans, Mom prepared her crostata on a small baking sheet. (In professional kitchens, it would be called a “quarter baking sheet”.) She would use 2 types of jam, with half of her crostata being coated with either strawberry or, very rarely, cherry, and, the other half peach. Mom didn’t start making jam and preserves until her retirement, so, she used store-bought jams for her crostata. She served it in little pieces, like those I’ve shown, presumably because the last thing we kids needed was more sugar on Christmas Day. Using a three-tiered serving dish, she was able to control how much we kids ate. When it was empty, there’d be no re-filling it for hours. Of course, when company was expected, the contents of that serving dish were strictly off-limits. Don’t worry. We still had our fill — just not from that tray. With regards to this post, I didn’t feel right calling it “Mom’s Crostata”, for it really isn’t. Mom didn’t leave us a true cookbook. Yes, she gave us kids our own cookbooks but none were a complete listing of all of her recipes. I do have a couple of her notebooks but the recipes listed are in varying stages of completion. Some are fully written, while others are nothing more than a few notes. Today’s recipe falls into the latter category, though I remember watching her spread the jam over the pastry crust, my mouth-watering the entire time. The only real question that remained was what recipe to use for the shortbread crust — and Mom’s notes did specify a “shortbread crust”. The answer came from a surprising source. Unlike Mom, I used my own jams for today’s crostate. In the first photo, strawberry jam with balsamic and black pepper, and, peach jam with white balsamic were used. The addition of balsamic vinegar is why both jams appear unusually dark in the photos. The 2nd crostata was made with tart cherry jam, to which a little bit of almond extract was added. Feel free to use whatever jam(s) you prefer. jam/preserves, amount depending upon the crostata’s size and whether 2 flavors are to be used. In a mixing bowl, use a spoon to mix the sugar, butter, salt, and egg yolk. Slowly add the flour and continue to mix until the spoon can no longer be used. Turn on to a lightly floured board and begin kneading, adding more flour until the dough begins to crack. Reserve a small portion of dough to be used for the lattice. Roll the dough between 2 sheets of wax paper until about 1/8 inch thick and slightly larger than the tart pan or baking sheet. Carefully remove one sheet of wax paper and place the dough on to the tart pan, dough-side down. Remove the remaining sheet of wax paper. Gently press the dough to fit the contours of the pan. Trim the excess dough and add to the reserve. Use an offset spatula to spread the jam, evenly covering the pastry dough. Roll out the reserved pastry dough as you did for the crust. Cut the dough into strips. Starting at one end, diagonally place the strips across the tart. Once completed, work from the other side placing strips diagonally in the opposite direction, creating a lattice in the process. Use the egg wash to lightly coat the lattice and any of the exposed crust. Bake in the lower third of a pre-heated oven for 30 minutes or until crust and lattice are lightly browned. Allow to cool before cutting. Serve at room temperature. The first time I prepared this crostata, I “blind baked” the tart shell for 8 minutes before filling it. This was a mistake, as you can see when looking at the first photo. The lattice is considerably lighter in color than the crust. After that attempt, I’ve no longer blind baked the crust and the finished tart’s shortbread appears more evenly baked. I just couldn’t bring myself to discard the excess shortbread dough, nor was there enough to make another crostata. I was going to make a few shortbread cookies, a personal favorite, when I had an epiphany. Using a very small ice cream scoop, make equally sized balls of dough, placing them on a small baking sheet. Once the sheet was covered with evenly spaced dough balls, use the bottom of a glass to press each ball into a flat cookie. Bake in a pre-heated 350˚ F (175˚ C) oven until the edges just start to turn brown, about 15 minutes. 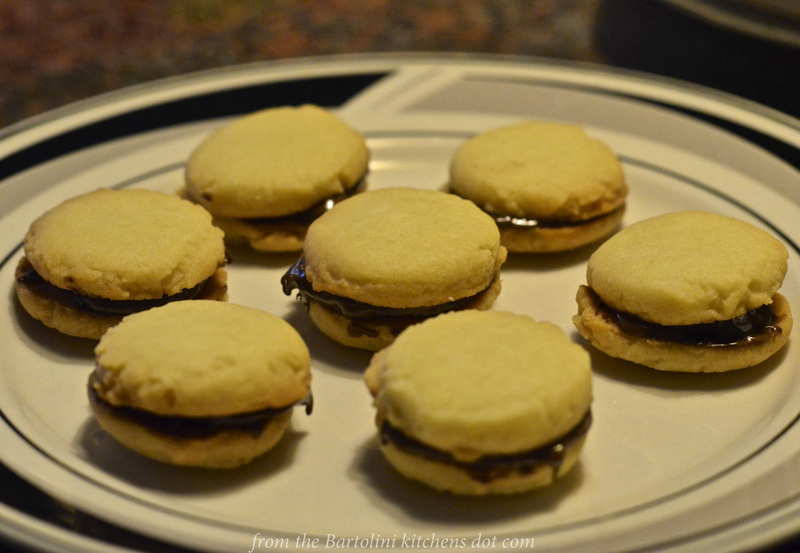 Once cooled, use 2 cookies with a bit of Nutella in-between to make a single sandwich cookie. (You could just as easily use jam for the filling.) Like the crostate, these cookies were well-received by the taste testers that live above me. So well-received, in fact, that now I’m considering making a Nutella crostata. This past Saturday is known as All Soul’s Day and in Marche, the Bartolini ancestral home, snails, lumache, are traditionally served. I won’t say much more, for fear of stealing the post’s thunder, other than to mention that you can learn all about preparing this delicacy by clicking HERE. This entry was posted in Family Recipes, Sweets (Dolci), Vegetarian and tagged Dolci, family recipes, Holiday, Italian, Jam, Recipes, Tart Cherries by ChgoJohn. Bookmark the permalink. I make jam crostatas all the time – and usually have parcels of sweet shortcrust dough in the freezer just to be handy. I generally use stone fruit jams – that is apricot, plum and cherry – but hadn’t thought to use two at once… Hmmm, something to think about. I’ve also never made them in tart pans before (preferring your mother’s more rustic method of a cookie sheet) and I can see how beautiful and professional it looks. I think I might get one of those packets of dough out of the freezer… Great post! Thanks. I’d no idea that the shortbread dough could be frozen. I did refrigerate mine until I was ready to make the sandwich cookies but didn’t think to take the idea to the next step. I’m so glad you mentioned this. Next time, I’ll make a double recipe of dough and freeze half for another day. I really did consider using a cookie sheet but, fact is, that’s a whole lot of crostata. The tart pan isn’t very large at all, allowing me to have enough crostata and still share some with the family that lives above me. I bet you make a great Osso Buco and look forward to seeing your recipe. Crostata is going straight onto my Christmas planning list. Looks soooo good! You and me both! There have been too many crostata-less Christmases. Not anymore! That’s a long way to go for dinner! I would be fat if I lived with you – far too much good food all of the time. Well now, isn’t that a strange way of complimenting someone. You know what I mean! As soon as I saw the top photo, I said, “Oh, look! Sidewalks!” No reflection on your baking capabilities, it’s the English translation for the word used in Quebec. The French word is “trottoir”. I did make some balsamic strawberry jam earlier this year (I called it “strawbs with teeth”) and it’s fab and could replace a Superball it’s so thick. Nuked a moment to soften it, that would be just the thing, wouldn’t it? Doesn’t balsamic go well with strawberries? Love that jam. Even so, I had to make a second crostata using cherry jam just to remain true to Mom’s original dish. My tasters lover all three so it really is up to you which one to make. 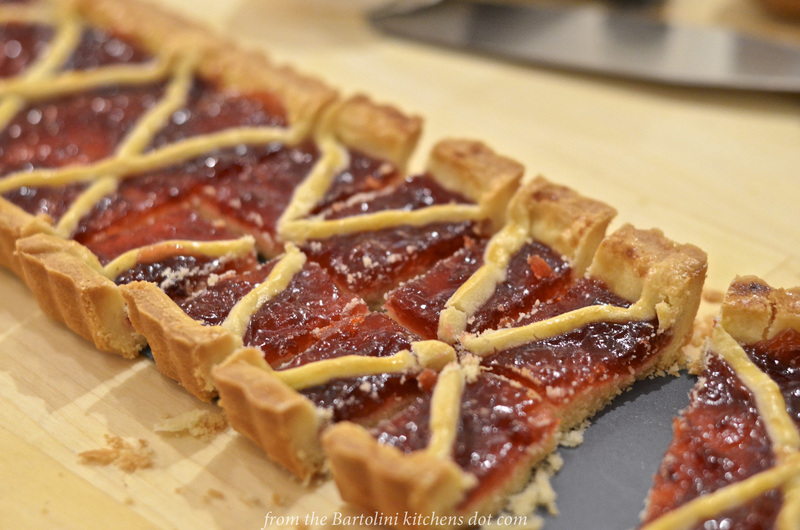 The crostata looks to die for and I love that you used two different types of homemade jam. Great post!! Oh and how long do we have to wait for the osso buco recipe? Yum!! Can’t wait! Thank you so much, Maureen. Truly. I consider these recipes to be her legacy. Knowing that she’ll be remembered by others when a recipe is prepared means a great deal to me. I’m touched. I bet those are wonderful. And I’ve got homemade jam! OH be still my heart, I have been waiting for this post…John that looks lovely and that shortbread dough looks wonderful! Thank you friend! Seeing your name makes me realize I’ve not seen any notifications of your post. Sure enough, you’re one of many hiding in the SPAM folder. So sorry. I’ll pay closer attention. oh I needed this—You’re such a good man!! You’re too funny! Glad you like the recipe. Oh my how perfect your crostata is! Now you have made me need to buy yet another cake tin – this one. Thanks for your brilliant blog! Thank you, Lise. I’m glad you like the recipe and that you took the time to comment. Thanks to this brilliant recipe I am currently licking my screen….you rock! Hi John…when I come by to “see” you I always get the warmest feelings that bring me right back to my mom’s kitchen. Whatever it was that my mom called it, I so recall seeing this type of dessert over the holidays. You know, our moms didn’t fuss over cookbooks and details, what they made was with love and passed down handwritten notes from their mothers. Like your mom left, I too just have my mom’s notes and while I don’t think she put this one in, I know for sure she made something similar. This will be a part of my holiday baking this year. Thank you so much for FINALLY sharing!! I continue to be amazed at just how similar our family experiences were, Linda, right down the recipe notebooks. At one time, much of her notes made little sense to me but now, having done quite a bit of cooking, I’m finally able to decipher them. Zia’s been a big help, too. Thanks, Teri. Maybe you could work it into your next zombie costume. “I was killed by a crostata!” I doubt it’s been done before. Lovely John, so simple yet utterly delicious. The absence of this crostata in Christmas posts of past can certainly now be forgotten, John! As far as I’m concerned…you’ve got it done early (after all, Christmas is still weeks away!). It sounds and looks so delicious…from the shortbread crust to your wonderful jam fillings! I’m partial to peach, and that is what I’ll probably use (at least in half). Thanks for providing a “non-toast” use of my homemade jams. 🙂 Surprisingly, I don’t own a tart pan…but that won’t stop me from making this…I’ll use a quarter sheet pan just like your mom did! Almost forgot…the cookie sandwiches look delish too! As for those cookies. hope you have some leftover dough. They’re a real treat.=, good enough to make on their own. You’ll see. Awesome crostata! It looks gorgeous, and that shortbread sounds awesome. And with your own jam? Winner! Those little Nutella cookies look awfully good, too. A Nutella crostata just has to happen, don’t you think? Can’t wait to see that! Thank you. Mom hit this one out of the park! That crostata is beautiful! A lot better than the one we did which leaked out the sides (tasted good though). Will try your method, looks way better! Thanks for the vote of confidence. 🙂 When you’re dealing with shortbread and jam, it’s going to taste good, with or without leaks. A little thing like a leak would not have slowed us kids down one bit. This looks so delicious. Who cares what you call it! I actually think I can make this. Yum! I love making shortbread cookies, CJ, so your Crostata really appeals to me. Now, about the leftovers and the Nutella filling. You’ve finally succumbed to Nutella. You’re a good man, CJ! Hello, Kathleen, and thank you. Yes, I did succumb to Nutella’s allure. That jar has been on the counter, taunting me for weeks. I finally put it to good use. Very good use. I hope you’ll find out for yourself. What an interesting dough! The whole thing seems absolutely perfect, and it so happens that a couple of weeks ago I made a batch of shortbread choc chip cookies, and was surprised by how much I enjoyed it. I think I need to get one of these rectangular baking dishes…. they make this crostata shine! I really do believe that Thanksgiving is more about who’s seated at the table rather than what’s on it, Sally. You’ll be with your family and that’s the important thing. I’ll probably be gone when you leave so I hope you have a safe trip and wonderful visit. Buon viaggio! They look amazing! I have all this jam and I was trying to remember this lattice topped cake that my dad used to make and there was your post in my inbox. Crostata! Now I don’t have to call my dad, lol, who’s too hard of hearing to have a proper phone call with. So, not to early, but right on time for me. Thank you. I certainly hope that this is the dish your Dad prepared. Not only will it be a treat for you but he’ll love that you made one, too. Good luck! It certainly is more fancy than my dad’s he hasnt made it in years. I have some fruit that I turned into jelly (runny) and Im going to try this. Ahhh the recipe I have been looking for- Crostata! John, wordpress is not sending me your posts. I missed your fun Halloween decorations until today and I say BOO on WP for not letting me know you posted. I will try to resubscribe. The photographs are just wonderful. Bet it makes the kitchen smell delightful, too. Thank you so much, Ruth. I was awash in memories of Christmas for much of the writing of this post. These were such a part of our Christmas Day treats. So sorry about your WP troubles. I’m having some, too, and like you, I just keep unsubscribing and subscribing. I wish WP would do something about it for us. Thanks for your visits and kindly comments, Ruth, even under the most trying of circumstances. Yours looks like a real crostata, so it must be a real crostata! The most classic pastry for all kind of crostate (jam, cream or fresh fruit filled) is Pasta Frolla no one else is admitted in Italy. I like your version! This post is full of wonderfulness! Firstly, the shortbread dough crust! Secondly, the jam mixed with balsamic vinegar! (My favourite husband and I have recently started sampling different types of balsamic, so this recipe is very timely.) Thirdly, shortbread with nutella! This is going on my Baking List. I’ll be a hero. I bet you and your “favorite husband” would like that strawberry jam with balsamic and black pepper. The balsamic gives counters the sweetness and it finishes with a bit of a bite from the pepper. It’s probably the favorite jam that I make. Love the story to go with the crostata . . . . OK: love the lumache even more – can’t think of any time this would not draw all my attention . . . BUT osso buco and am ‘all yours’ if you know what I mean . . . .hmpph: I guess we’ll have to wait till you have spent fascinating autumnal foodie hours with Zia ere we hear of that!! Guess Max is snoring by now .. . .a long quiet rub from me please . . .
Hello, Eha! Running a little behind here but, what else is new? Your pictures are gorgeous and have me wanting to jump up and go make one of these crostatas. Definitely will be using homemade jam, but wish I had a jar of your strawberry jam with balsamic and pepper. My MIL gave me some of her 1930’s cookbooks. They are a hoot and it seems that most were developed for promotional reasons. Great post John! Thanks for the compliments, MJ. This crostata was perhaps my favorite treat that Mom made every Christmas. That strawberry jam is my favorite, too. I love the bite the pepper gives it. You’re right about the cookbooks. 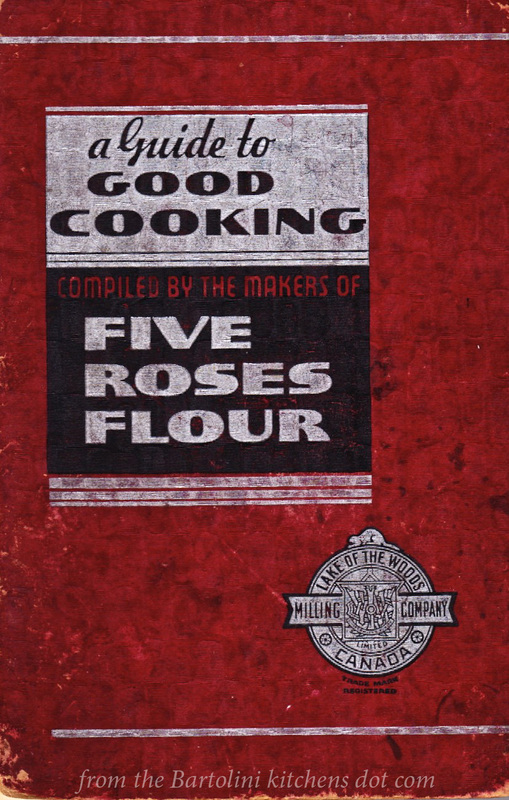 This one has many great recipes but all mention the benefits of using “Five Roses Flour”. those photos make me smile 🙂 And I love that you have a plan for leftover dough. Very resourceful! I see you finally managed to bake it and quite early in the year, before Christmas. John if you could bake and decorate that Crostata the way you did, then you’re not allowed to have any more excuses regarding “lack of baking skills” You are a certified pro. Please send me a virtual slice!!! I didn’t know what I am baking often is called a Crostata. Sounds more like an meditareanian island to me. Beautiful! You always manage to bring back memories with your recipes. Since I know you’re not a fan of baking and neither am I, it must be an easy recipe to put together (especially if you have a food processor 😉 – I’ll definitely try this for my next dinner party! Thanks you John, indeed you’re not the first one to tell me. I have made some changes on Sunday and I hope it’s fine now. I tested it and finally managed to post a comment. Thanks a lot for your indirect comment though. I’m keeping my fingers crossed it will work from now on. I’m really sorry to say that I tried again and my username still wasn’t being accepted. I’ll be heading to Zia’s shortly and will try again when I return home in a couple of weeks. Good luck! I know you must be frustrated. It is getting frustrating… I would appreciate if you could let me know if the comments finally work. Thanks. Meanwhile I hope you’ll have a nice stay at Zia’s. Funny how our memories dictate what we call things. I made the apple pie type crostata over the weekend and it was gone in seconds!! It went quite well with Bailey’s cinnamon ice cream. This version looks fabulous. I have the same shape tart pan so this may have to happen soon! You mentioned the C word John, and I’m not talking pies I’m talking Christmas! Grump, grump, grump. OK that fruit pie or tart of yours looks totally enticing. My mum always use dto make jam tarts with left over pieces of pastry, nothing as smart as this, but the basics are there. Thank you for the reminder. As a child, you sound like one of the boys that lives above me. He doesn’t like these at all. Too sweet. His brother, however, gobbles them up. If his tastes change, he’ll regret all the sweets he’s passed up during his youth. Well, now I’ve never made a crostata and I’m going to have to do something about that! I made jam bars (a very distant cousin) when I discovered I had far too much jam to ever use up. I think these pretty crostata tarts would just do the trick for the snow we are expecting on Sunday. A hot cup of tea and a slice of crostata would be heavenly. *sigh* it’s so nice to have time to blog read and visit my favs.. I hope all is well with you and Max, from the baking coming out of your kitchen I think it must be. Did Max get to sample your Nutella cookies… or are those too much chocolate for him? Glad that you’ve more time for us in the blogging world, Barb. I feel I must warn you. Once you make these and serve them to your family, they are going to want you to bake them again … and again. We all loved them — and still do. Like you, I plan on using up last season’s jam on them. Sure beats a piece of toast. Beautifully presented no matter what you call it; but crostata it is. I have a fear of making pies or anything requiring making dough (I have no idea why). This sounds not too difficult, so maybe this is what will get me over that fear. Homemade looking is good looking! Like your Mom’s method of making the crostata on a baking sheet. Also like your 2 jams idea. I would make ice cream sandwiches with the shortbread cookies, wouldn’t mind having one at this very moment. 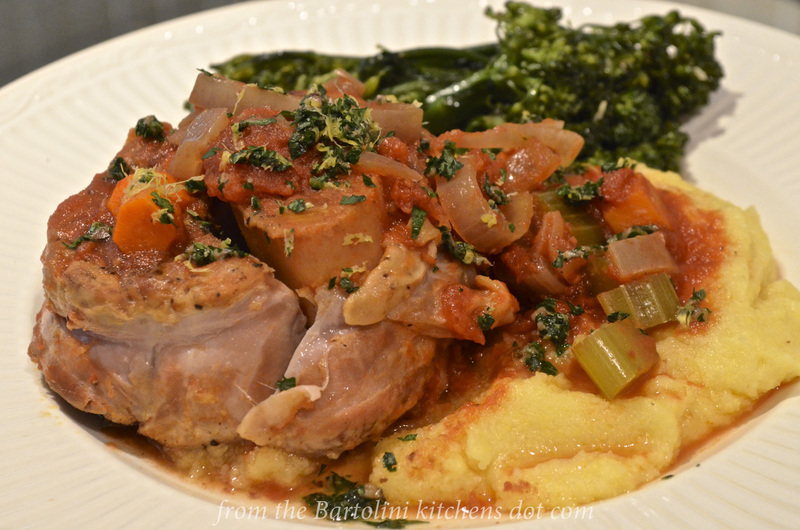 Looking forward to your Osso Buco recipe, this is one of my favorite Italian dishes. me and my family isn’t a cookbook person, we used to pass family recpe within conversation…. Isn’t it funny how some holidays just aren’t ‘right’ without certain traditions? I remember one Thanksgiving deciding to skip my sweet potato casserole – my husband and daughter were horrified! These look like very special treats and I love how you’ve used two different jams. That would make it hard to decide so I guess you have to have at least 2 pieces right? I know what you mean about Thanksgiving dinner, Diane. When I hosted the dinner, I tried introducing a new side dish for a few years. No matter how well received, I wasn’t “allowed” to retire one of the old standards. So, more and more food was being prepared. I gave up trying to add something new. It was exhausting! Hey John, I just found your blog from EllaDee’s link. 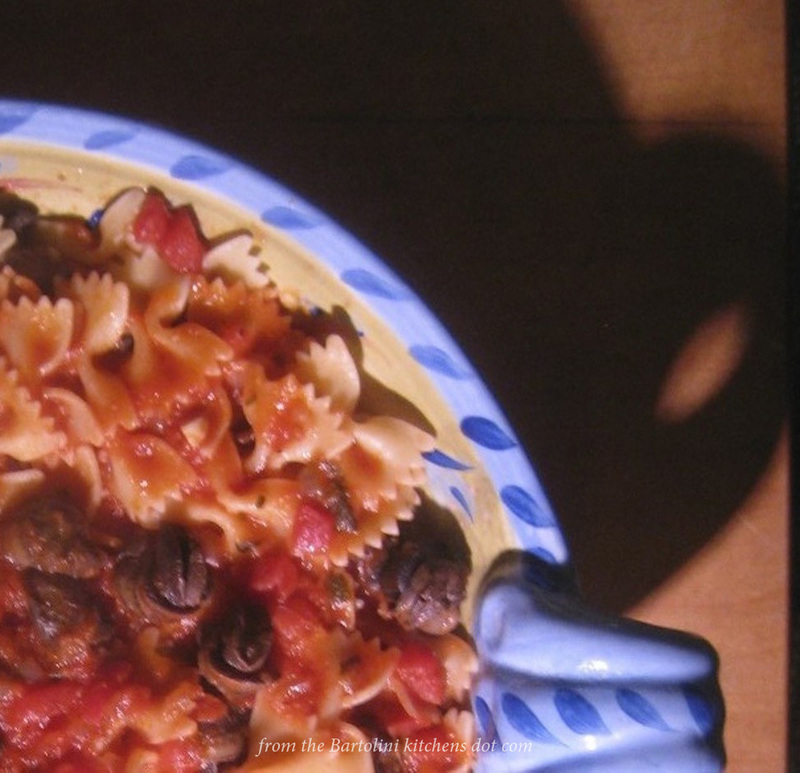 I’m a third-gen Italian from Chicago who goes through cooking spurts (and noncooking spurts). This crostata looks delicious, and what you did with the left over dough, OMG. Nutella! I want to make those. I wrote a short memoir about how I learned to cook. I put a recipe on my blog on occasion, since it’s mostly a writer’s blog. I do have a recipe page with the links to those recipes, and a few of them were passed down to me. I’m so glad you have those recipes from your family. I have many scribbled recipes from both of my grandmothers, but they weren’t well written out. I wish I would’ve spent time cooking with them before they left this earth. It’s so good that you did that with your family. Hi, Lori. It’s a pleasure meeting you. I just took a quick look at your WP home and checked out the recipe page. You’ve got some good ones listed and I cannot wait to get some time to look deeper, as well as to check out your writings. Although mom and I did some cooking together, I really wish I could have spent more time with her, learning all of her recipes and “tricks” in the kitchen. I have been able to spend time with her sister, “Zia”, and I’ve learned most of our family’s recipes from her. This blog would have ended after a couple of months without her help, no doubt about it. Hi, Christina, and thanks. Good to see you again. How’s the Little Guy? This crostata is lovely John. It’s quite different from what I call a crostata, which is basically a pie presented atop a very rustic (read: lopsided) crust with the edges folded over. Your crostata has reminded me of an old Belgian recipe, a jam tart that my mother used to make. Mom died in June. In a few weeks I’ll be hosting a baby shower for my eldest daughter, and I think serving that tart will be a touching way to honour my mother, who would so have wanted to be there. It’s our first special event since her passing, so I imagine there may be a few bittersweet moments. Whatever it is called, crostatas are yummy! Two-tones rectangle is beautiful. I’ll say it again, John, you’ve turned into quite baker…and photographer! Look at all your lovely photos! So you grew up with a crostata and I grew up with jam tart 🙂 Oh, I love jam tarts or crostate, what’s in a name? It’s all deliciousness to me! I love a straightforward strawberry or raspberry one, with lashings of warm custard. Have you tried them with custard? You must, I think you’ll love it. Can’t wait for your Osso buco recipe, I made it once a while back and loved it. I’d love to see how you make yours. Hope you’re having a great week! Mines about to get hectic soon, so I thought I’d better visit you! I’ve not tried a custard tart and you’re the 2nd person to mention them. It does sound like a great way to go, especially with a little jam. Yum! I have to give it a try. You’re so right about getting together with family. I’ve found that this blog will often spur the discussion and reminiscing. It’s kind of nice to see and be a part of. I’ll be leaving for Zia’s very soon and I’ll be sure to give her your well-wishes. Take care, BAM. Thank you so much for this recipe. I have that tart pan and also 4 small pumpkin shaped tart pans that the bottom lifts out of. I made tons of jam last year and this recipe will be a big hit for Thanks giving dinner. I enjoy looking through your recipes. Individual tart pans will be perfect for a crostata. They’ll make quite the impression on Thanksgiving, I’m sure. I know what you mean about having jam around the house. I can only eat so much toast, no matter how good the jam. There’s no growing tired of crostata, on the other hand. I love ’em! Thanks, too, for taking the time to go through the archives. I’m very glad that you’ve liked what you’ve seen. Have a good week. the Bartolini kitchens <Loved it! I made your Crostata recipe this past weekend with Fig preserves and I topped it with a little bit of prosciutto (I’m a salty-sweet girl). I’m totally addicted to this dessert. I’ve even taking this to my family Thanksgiving this year. Thanks Again for sharing this wonderful recipe. Oooh. I love the idea of a savory crostata and fig jam with prosciutto would be the way to do it. That sounds wonderful and will give me a reason to make fig jam next year. I hope your family all enjoyed your dessert on Thanksgiving. I know I would have! Thanks for coming back to tell me. This is beautiful, lovely and the pieces are not cut nearly big enough! Simply gorgeous! !